March is usually the planting month for trees, but this year March was part of winter. The tree planting activities have been moved to April with the hope that we don’t drown in the fields we are trying to plant. Yes, it has been an abnormal year, but some things never change and that is the need to continually plant more trees both in riparian buffers to protect our streams, and also on our own properties to replace some that die, or are cut down for construction. There also is a chemical reason to plant trees–the carbon transfer. Green trees take up the carbon dioxide from the use of fossil fuels for heating and transportation. Translated into a sobering thought, think of it this way; have you planted a tree for every tree you’ve used in your lifetime? What a thought. Many organizations are attempting to bring an awareness of the need to plant trees. The Goose Creek Association has a project called “The Goose Creek Challenge.” The goal is to plant riparian buffers along the creek and its tributaries, starting in the headwaters, to protect our water quality. Trees not only soak up much of the rainfall, but when we have excessive rain at one time, they provide a protective edge to keep water from flowing from fields where soil is loosened and capture it before it rushes into the stream and causes further erosion by its volume. Right now, trees are being planted using volunteers, including area middle and high school students, along with the Soil and Water Districts that provide the professional knowledge and the native trees obtained through grants. The Goose Creek Challenge Fund also has money available for trees and shrubs in areas where stream bank erosion is an issue, and also welcomes donations for this fund as well. 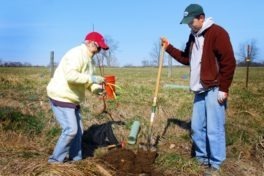 Other organizations like the Arbor Society also provide free trees. If you wish to join the tree-planting effort, contact one of these organizations or the Chesapeake Bay Foundation for a list of others. All our good work in this area affects the Bay, and all the water between here and there. We all live downstream. Another source for trees is Wagenburg Farm in Middleburg, which produces field-grown, climactically adapted, native shade trees for conservation landscaping and habitat restoration. The farm grows species selected from historical lists for their adaptability, hardiness and transplant survivability. Larger trees are available in some species and all trees are field grown and acclimated to local soil and weather patterns. “We specialize in native shade trees of the Eastern temperate forest,” said Michael Calley, manager of Wagenburg Farm. “Mostly oaks, maples, poplars, dogwoods, redbuds, etc. and some evergreens such as Southern Magnolias and Eastern Red Cedars. Our trees are growing in the field, in the native soil. After the first year, they are getting whatever moisture falls from the sky and they are dealing with the local insects without a lot of interference or inputs. All of our trees are unique individuals that have to be seen to be appreciated. And finally, a closing thought on tree planting, from Thomas Fuller. It was brought to my attention by the Arbor Society. 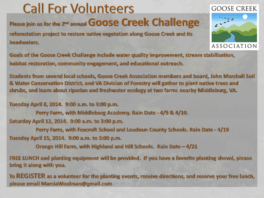 2nd Annual Goose Creek Challenge – Volunteers Needed! Please join us for the 2nd annual Goose Creek Challenge reforestation project to restore native vegetation along Goose Creek and its headwaters. Goals of the Goose Creek Challenge include water quality improvement, stream stabilization, habitat restoration, community engagement, and educational outreach. Students from several local schools, Goose Creek Association members and board, John Marshall Soil and Water Conservation District, and VA Division of Forestry will gather to plant native trees and shrubs, and learn about riparian and freshwater ecology at two farms near Middleburg, Va.
FREE LUNCH and planting equipment will be provided. If you have a favorite planting shovel, please bring it along with you. We have been particularly busy this year expanding and maintaining our historic districts, while providing ongoing water quality monitoring and creating and protecting riparian buffers. There, that sounded easy, but it takes a cast of dedicated members, staff and volunteers. It is that time of year to ask you for your support so we can continue our efforts through 2014.
holds community educational forums, including the upcoming showing of “Switch” at The Hill School on Friday, January 31, 2014. For more information see http://www.goosecreek.org. We are the voice of over 600 members in Loudoun and Fauquier Counties. We always welcome more volunteers. If you are interested, please be sure to indicate what your interests are on our return envelope. Including your e-mail address on the remittance envelope helps us, as a green organization, use less paper and reduce our mailing costs for critical alerts and reports. We do not share our membership directory or e-mail addresses. For more information, please contact the GCA office at 540-687-3073 or info@goosecreek.org. Also, please check our website at http://www.goosecreek.org for updates. 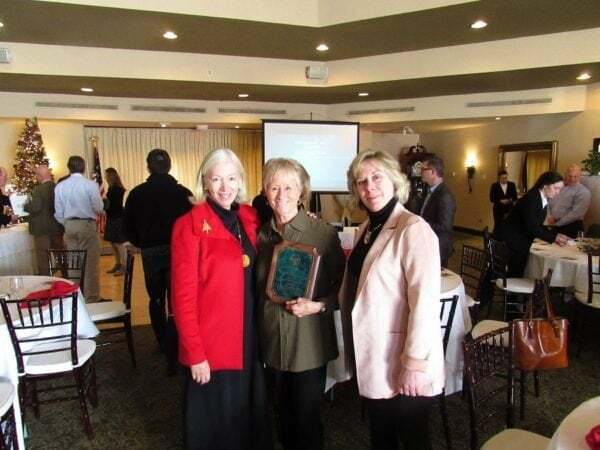 The Goose Creek Association kicked off its 2013 riparian buffer project called The Goose Creek Challenge, chaired by Marcia Woolman, using a joint project with Tom Turner of the John Marshall Soil and Water District (JMS&WD), to plant 433 trees on March 15 and 16. The success of this watershed conservation effort was in large part attributed to local schools that sent ecology club and science class students from Highland Upper School with teacher Jon Kraut and Middleburg Academy with teacher Ann Reimer. The Piedmont Environmental Council’s Andy Washburn assisted in locating our young helpers. All together forty two students participated on Friday, along with members of the Virginia Dept. of Forestry and other staff from JMS&W. Several volunteers from the community and the Goose Creek Board also rolled up their sleeves. The Saturday volunteers consisted of students who were brought to the farm by parents who worked with them in teams along with many who also participated on Friday. Over the two days more than 100 people of which nearly all were volunteers, provided approximately 285 hours of community service. The students were provided with certificates verifying this from the Goose Creek Association. The goals of the Goose Creek Challenge are wide ranging, and begin with restoration and preservation of the stream banks and wetlands within the Goose Creek watershed. Our primary concern is the health of our watershed, but as you know “we all live downstream.” The Chesapeake Bay and Leesburg and Fairfax are all downstream. The work we do for water quality here in Fauquier and Loudoun counties pays dividends to millions we don’t even know. That is just the beginning, as educational goals are equally important. To provide a meaningful educational experience for the students that re-enforces the science lessons they are learning is the key to life time learning. To have parents bring their students on a weekend and share in that learning fulfills yet another goal of community environmental education. No meeting or lecture can bring forth the understanding that comes from hearing Tom Turner explain the value of trees to the protection of water quality while he holds a young tree and you lean on a shovel or tree tube and listen. Then he continues by discussing the value to wildlife and the types of animals and birds that will benefit from the seeds and produce of these trees and bushes. Only native plants were used in an effort to help restore the food base for the song birds and migratory birds that use our countryside as their homes. It will support the squirrels, chipmunks, rabbits, mice, foxes and deer as well. The valuable shade that will be created and the root structure that will hold the ground firmly while absorbing huge amounts of water will, as they grow, take up more of our heavy rains and prevent them from spilling sediment and pollution from fields into the waterways. They will eventually prevent nutrient overloads that are creating the dead zone in the Bay. So much value from this project, leads the Goose Creek Association to believe that our job has just begun. 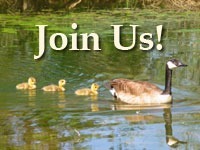 Land owners who need riparian buffers should seek information on the web site www.goosecreek.org. Schools that want this opportunity for their students should seek this connection, and parents wanting to spend some quality time with their children and feel the joy of community service, should come too. It takes a village, and we are one. March 15-16, 2013: Goose Creek Challenge Tree Planting. Due to the weather and the likely possibility that it will be at least a week before the ground will be suitable for planting, “snow” dates of March 15th and 16th have been set. Directions to the March 9th tree planting partnership project of the Goose Creek Association, John Marshall Soil & Water District, Piedmont Environmental Council, and local volunteers. If you register ahead of time at mwoolman@crosslink.net, you will be provided with a lunch. DIRECTIONS: from Middleburg – go west on Rt. 50 and turn left at Atoka Road at the village of Atoka. Go 2 + or – miles to Oak Grove Rd. and turn right into Oak Grove Farm. The project site is on the right as you go down the farm lane. Follow the signs. From Marshall – take Rectortown Road to Atoka Rd and turn right. Go down Atoka Rd. 2+ or – miles to Oak Grove Farm road on the left. Turn into the farm and the tree planting field will be on your right. 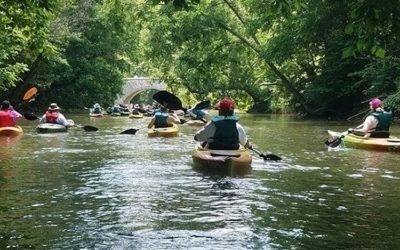 After 10 years of water quality monitoring by members of the Goose Creek Association, it has been found that Goose Creek is one of the best streams in the Piedmont of Virginia. This is in no small part due to many cooperative landowners, who live along the many steams in this 350 square mile watershed. However, Goose Creek, including its tributaries, is facing significant challenges to its long-term health. This year the Goose Creek Association is initiating a community effort to stabilize the banks of Goose Creek and its tributaries, by undertaking a significant tree planting effort that we will call ―The Goose Creek Challenge. At our annual Educational Forum at the Middleburg Community Center on March 7, 2012 we discussed how native willows, other plants and trees can stabilize the stream banks. It was explained how tree planting will engage volunteer school students, Scouts and families, thus accomplishing conservation education. Financial options were detailed. We look forward to working with interested landowners as we begin this multi-year challenge to protect our creek for future generations. We hope to engage three types of participants: 1) landowners who desire to stabilize their creek banks to protect them from erosion, and/or create a buffer of trees; 2) volunteers who are willing to plant the shrubs or tree stakes, as well as already rooted small trees; and 3) donors who would contribute to a new ―Goose Creek Challenge fund which will help move this project forward. Hopefully, our membership will consider one of the three categories. For more information about the ―Goose Creek Challenge please contact the Goose Creek office at (goosecreek@erols.com or call 540-687-3073). Let’s work together to keep Goose Creek the ―Gem of the Piedmont.